The elver runs in the spring of 2017 were considered to lower than some of the more recent runs (e.g. 2014). However, in May 2017 there was a significant elver run at Ennistymon Falls on the Inagh River in Co Clare. The video below shows the elver run here during early May 2017. The elvers in the video are generally healthy but ever year a major outbreak of Ichthyophthirius occurs at this site. Some of the elvers are already affected by this parasite. 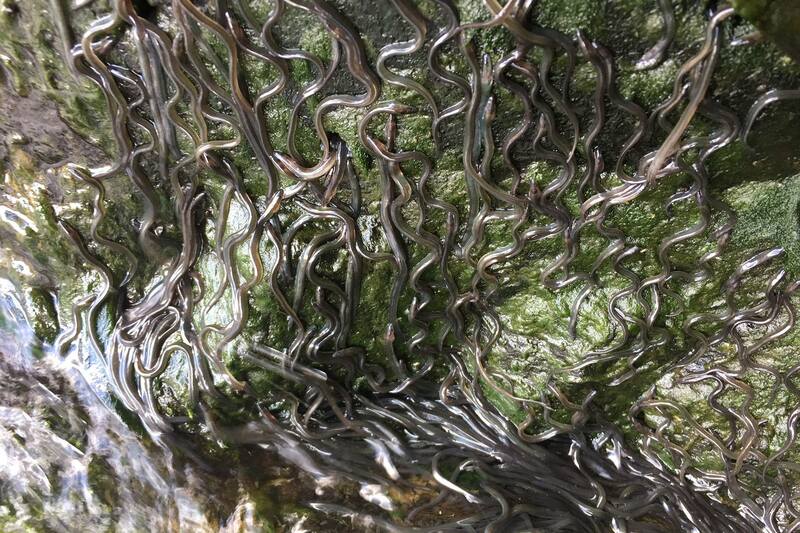 The elvers here are under serious stress as they repeatedly try and fail to climb the falls. Indeed, hundreds of thousands of elvers die here each year trying to climb the falls. These are natural falls, but have been modified in the past. There is a history of hydro power at the site and there is a two-stage denil salmon pass which collects all the flow in the river during low flow. Elvers cannot use this denil pass so the salmon pass contributes to eel passage problems at this site. A new small hydroelectric station and upgraded fish pass was under construction at this site during May 2017. However, incredibly the fish passage improvements did not include an eel pass. Inland Fisheries Ireland installed a new elver trap here in advance of the 2017 run. 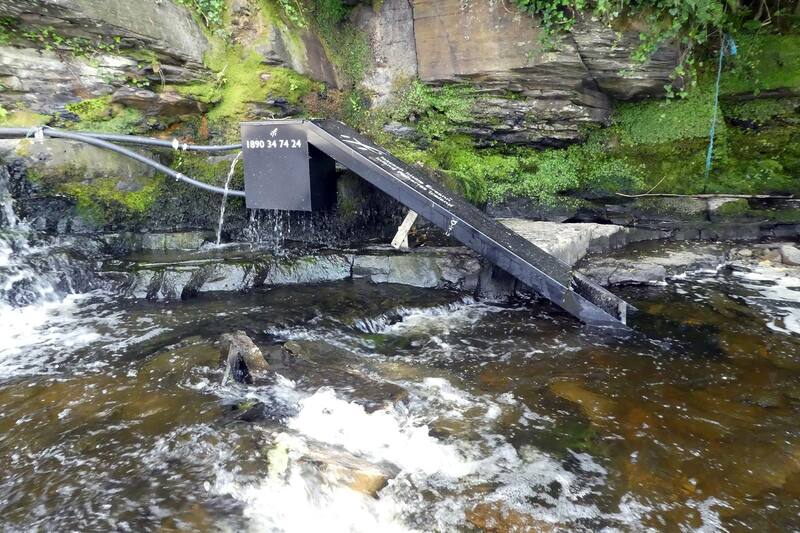 Ireland is finally making an effort to monitor elver runs with relatively good index traps. This trap was installed following a number of years of campaigning by this page. However, the vast majority of elvers bypass this trap and die trying to climb the falls. New hydroelectric scheme being constructed at Ennistymon Falls, May 2017. Monitoring elvers using index traps is not enough – we need to be opening up migration pathways also. 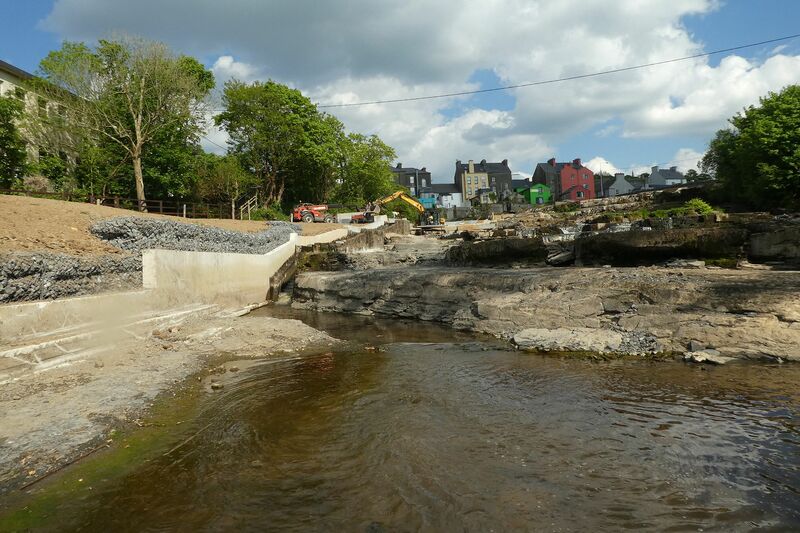 The fact that a hydroelectric station is under construction at Ennistymon falls was an ideal opportunity to improve elver passage. It is unacceptable that no elver pass is currently being provided here as part of this scheme. We should not be letting elvers die at sites like this – we need to provide eel passes or an effective trap and transport programme. When developments like the hydro scheme are at planning a condition to provide an eel pass has to be imposed. At the minimum the elvers here should be trapped effectively and used for restocking. Also, see this video below of the elver run at this site in 2016. Furthermore see this post entitled ‘Are Inland Fisheries Ireland’s elver trapping indices accurate?‘ which provides information on previous elver monitoring work completed at this site.